I have always enjoyed sweet potatoes at Thanksgiving and Christmas–with brown sugar, pecans, butter, marshmallows…yum. Such comfort food. In the last couple of years, I’ve discovered that sweet potatoes are not only really really good for you, but also really really good all year round! and super easy to make! 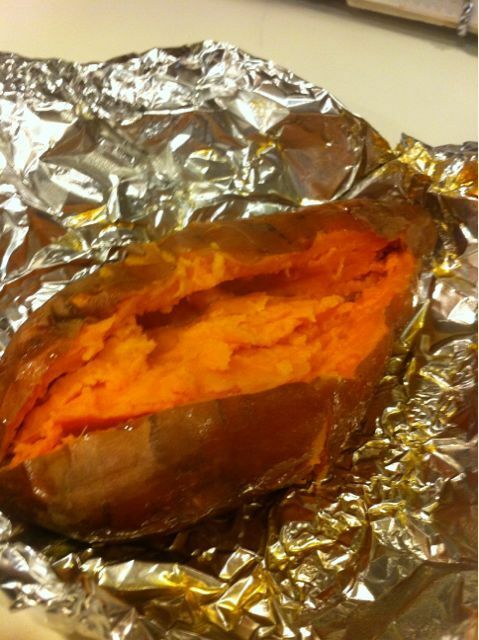 Wrap a sweet potato in foil. Make sure its sealed well. I use the heavy duty foil because if it gets a hole and drips in your oven, your smoke detector will go off when the drips start to burn. grrr. 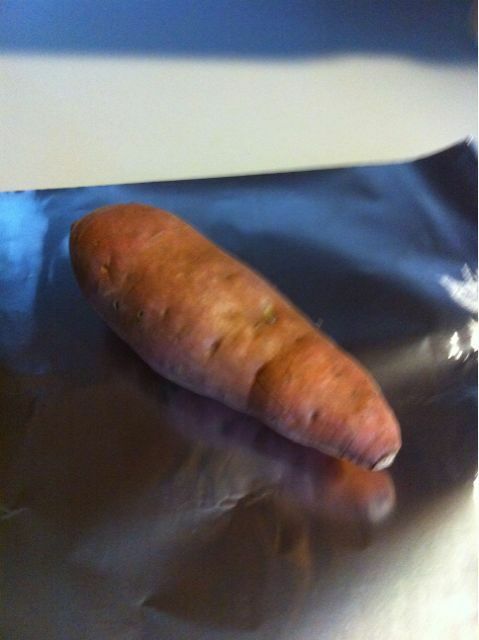 Bake that tuber for 1 hour at 400 degrees–depending on how big it is, it may need a lil bit more time. You’ll know its done when you squeeze it (with a gloved hand, of course) and it gives. Don’t rush it or it will be still a lil hard in the middle. I like mine nice and soft. I’m not sure if you can tell in the picture below, but it makes its own glaze!! So yummy. I eat the peel and all–it’s like candy. All natural with no added sugars! TRY it! and do NOT put butter or brown sugar on it, till you’ve tried it without! Even people who said they don’t really care for sweet potatoes, tried these and LOVED ’em! That seriously looks delightful. I’m going to have to go to the store today and try it out. I LOVE your other sweet potato recipe, I make it as my own every year.